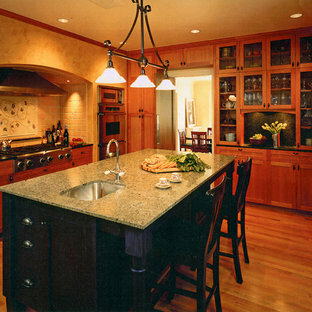 Jamestown Designer Kitchens, of Savannah, GA designed and installed the cabinets and walnut counter top. A traditional house that meanders around courtyards built as though it where built in stages over time. Well proportioned and timeless. Presenting its modest humble face this large home is filled with surprises as it demands that you take your time to experiance it. February and March 2011 Mpls/St. 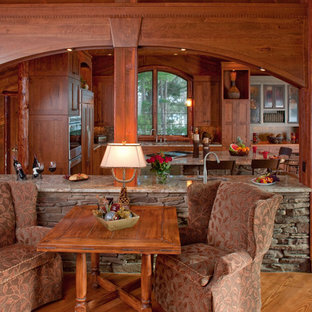 Paul Magazine featured Byron and Janet Richard's kitchen in their Cross Lake retreat designed by JoLynn Johnson. Honorable Mention in Crystal Cabinet Works Design Contest 2011 A vacation home built in 1992 on Cross Lake that was made for entertaining. The problems • Chipped floor tiles • Dated appliances • Inadequate counter space and storage • Poor lighting • Lacking of a wet bar, buffet and desk • Stark design and layout that didn't fit the size of the room Our goal was to create the log cabin feeling the homeowner wanted, not expanding the size of the kitchen, but utilizing the space better. In the redesign, we removed the half wall separating the kitchen and living room and added a third column to make it visually more appealing. 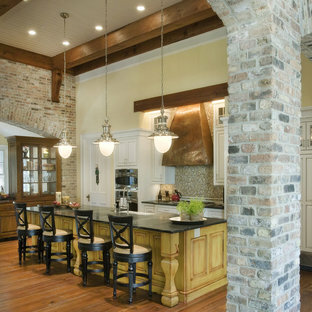 We lowered the 16' vaulted ceiling by adding 3 beams allowing us to add recessed lighting. 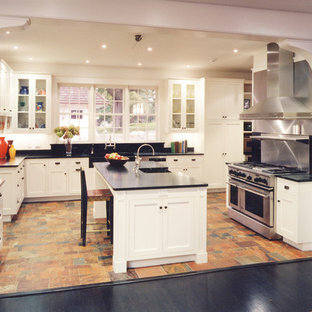 Repositioning some of the appliances and enlarge counter space made room for many cooks in the kitchen, and a place for guests to sit and have conversation with the homeowners while they prepare meals. 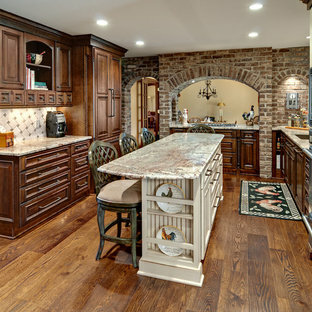 Key design features and focal points of the kitchen • Keeping the tongue-and-groove pine paneling on the walls, having it sandblasted and stained to match the cabinetry, brings out the woods character. 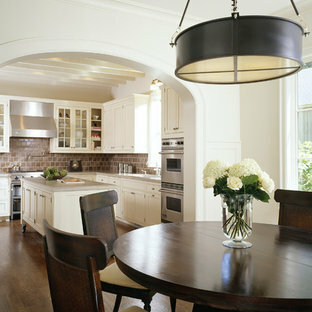 • Balancing the room size we staggered the height of cabinetry reaching to 9' high with an additional 6” crown molding. 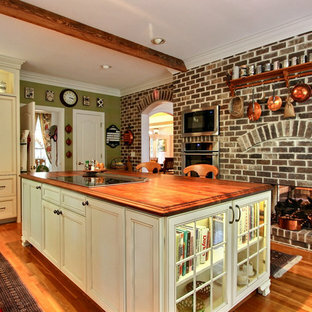 • A larger island gained storage and also allows for 5 bar stools. • A former closet became the desk. 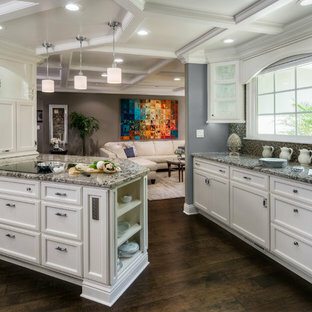 A buffet in the diningroom was added and a 13' wet bar became a room divider between the kitchen and living room. 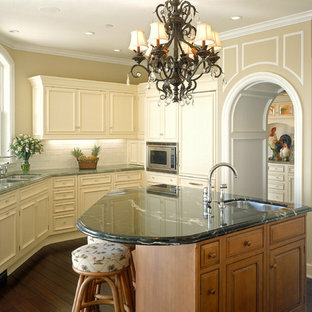 • We added several arched shapes: large arched-top window above the sink, arch valance over the wet bar and the shape of the island. 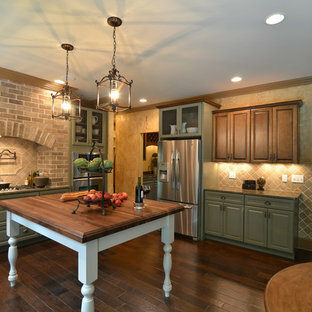 • Wide pine wood floor with square nails • Texture in the 1x1” mosaic tile backsplash Balance of color is seen in the warm rustic cherry cabinets combined with accents of green stained cabinets, granite counter tops combined with cherry wood counter tops, pine wood floors, stone backs on the island and wet bar, 3-bronze metal doors and rust hardware. 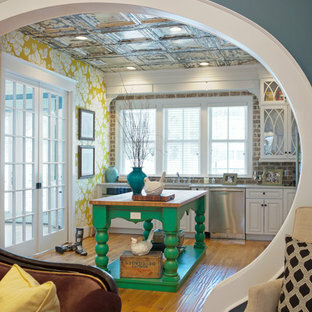 Dramatic archways linking rooms visually to one another in graceful fashion define the interior spaces. Materials: Afyon White Classic Brushed (Floors) Deep Blue® Brushed (Countertops) Square One Archtiects in Sunrise Florida worked with the two materials to come together for a beautiful end result. These two products are "sister" products from our same quarry in Turkey.